Abdullahi, Mehdi, Pazhuhan, Musa, Ghasemzadeh, Behnam. (1395). Tabriz Intra-urban Spatial Disparities. معماری و شهرسازی آرمان شهر, 9(16), 141-152. Mehdi Abdullahi; Musa Pazhuhan; Behnam Ghasemzadeh. "Tabriz Intra-urban Spatial Disparities". معماری و شهرسازی آرمان شهر, 9, 16, 1395, 141-152. Abdullahi, Mehdi, Pazhuhan, Musa, Ghasemzadeh, Behnam. (1395). 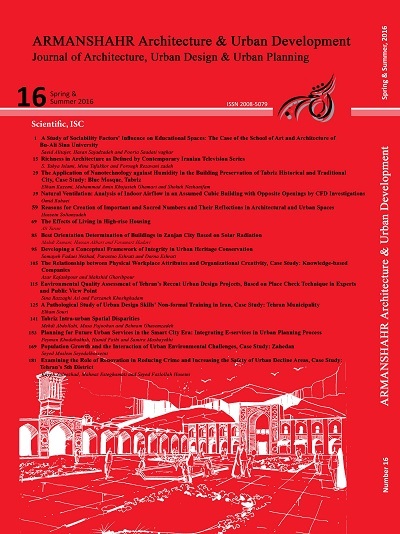 'Tabriz Intra-urban Spatial Disparities', معماری و شهرسازی آرمان شهر, 9(16), pp. 141-152. Abdullahi, Mehdi, Pazhuhan, Musa, Ghasemzadeh, Behnam. Tabriz Intra-urban Spatial Disparities. معماری و شهرسازی آرمان شهر, 1395; 9(16): 141-152. 1Ph.D. Student in Geography and Planning, Department of Geography and Urban Planning, University of Tabriz, Tabriz, Iran. 2Ph.D. in Geography and Urban Planning, Lecturer at Faculty of Social Sciences, Allameh Tabataba'i University, Tehran, Iran. 3Ph.D. Candidate in Urbanism & Department of Art and Architecture, Science and Research Branch, Islamic Azad University, Tehran, Iran. To achieve sustainable urban development and values from social justice; it is essential that all citizens enjoy resources, facilities and life opportunities equally. Due to lack of a stable or systematic approach of measuring urban problems, disparity in environmental conditions or access to social and physical infrastructures is more obvious, especially in the cities of developing countries. In this article, a hybrid method is presented using urban indicators and geographical information system (GIS), as reliable identification tools and a criterion, to produce information related to policies in complex and multidimensional aspects of spatial disparities. His information could be used by the policy makers in order to inform them about where the first target is and in what proportion they should invest. In case study of Tabriz, this method indicates how the combination of urban indicators and GIS is a valuable tool for access of better management in resources towards balancing and spatial order in population and activities. The results of this study can help to apply reforming policies through better understanding of intra-urban disparities and optimal trace of resources. It can also help to identify poor households based on redistribution credit with the geographical component attractive to planners and decision makers. Andersen, H. T., & Van Kempen, R. (2003). New Trends in Urban Policies in Europe: Evidence from the Netherlands and Denmark. Cities, 20(2), 77–86. Castells, M. (1996). The Rise of the Network Society. Malden, Mass. : Blackwell Publishers. Regional Studies and Research. 3(10), 1-4. Driouchi, A., & Malki, K. (2011). Transforming Uncertainties into Risks and Poverty Alleviation: Lessons Learnt from the Successful Rescuing of Miners in Chile. Hall, P., & Pfeiffer, U. (2000). Urban Future 21. London: E & FN Spon. Hall, T. (2001). Urban Geography, London: Routledge. Harvey, D. (2000). Spaces of Hope. Berkeley. to Develop Support Programs in Line with Targeted Subsidies, City Economy, (8), 19-33. Huxhold, W. (1991). An Introduction to Urban Geographic Information Systems. New York: Oxford University Press. Innes, J. (2004). Knowledge and Public Policy. New Brunswick, U.S.A.: Transaction Publishers. Kingsley, T. G. (1999). Building and Operating Neighborhood Indicator Systems: A Guidebook, National Neighborhood Indicators Partnership. The Urban Institute. Available from. <http://www2.urban.org/nnip/ pdf/guidebk.pdf>. Knox, P., & Pinch, S. (2000). Urban Social Geography: An Introduction. Harlow: Prentice Hall. Evaluation Approach for Assessing Urban Sustainable Development: A Case Study for China’s Jining City. Martı´nez, J. A. (2000). Evaluating Housing Needs with the Use of GIS. Habitat International. 24(4), 501– 515. Mega, V. (1995). Sustainability Indicators for European Cities. European Foundation for the Improvement of Working and Living Conditions. In OECD/Rennes Conference on Urban Indicators. Rennes: OECD. Meza, L., Arenas, R. B. (Eds. ), 2do Congress International Ciudad y Territorio Virtual (pp. 92–96). Concepcio´ n, Chile: Ediciones Universidad Bio Bio. Minujin, A. (1995). Squeezed: The Middle-class in Latin America. Environment and Urbanization, 7(2), 153–165. Rawls, J. (1999). A Theory of Justice (rev. Ed.). Cambridge, MA: Harvard University Press. Santos, L. D., & Martins, I. (2014). Intra-Urban Health Disparities: Survival in the Wards of 19th- Century American Cities, National Funds through FCT - Foundation for Science and Technology under the project «PEST-OE/SADG/UI4084/2014». Shah, TayyabIkram, Bell, S. (2013). Exploring the Intra-urban Variations in the Relationship among Geographic Accessibility to PHC Services and Socio- Demographic Factors, Conference’ Health GIS 13, November 5–8, 2013, Orlando, Florida USA. Shokooei, H. (1994). New Approaches on Urban Geography (Vol. I); Organization of Research and Development of Social Sciences Books (Samt), Tehran. Smith, D. M. (1973). The Geography of Social Wellbeing in the United States: An Introduction to Territorial Social Indicators. New York: McGraw-Hill. Talen, E. (1998). Visualizing Fairness. Equity Maps for Planners. Journal of the American Planning Association, 64(1), 22–38. Settlements]. (2001). Cities in A Globalizing World. Global Report on Human Settlements 2001. London: Earth Scan. UNDP [United Nations Development Program]. (2001). Human Development Report 2001. Oxford: Oxford University Press. UNDP [United Nations Development Program]. (2005). Human Development Report 2005: International Cooperation at a Crossroads: Aid, Trade and Security in an Unequal World. Human development Report. New York: United Nations Development Program (UNDP), 372. Planning B: Planning and Design, 20, 709–728. the Problem. In D. Westendorff (Ed. ), From Unsustainable To Inclusive Cities (151–296). Geneva: United Nations Research Institute for Social Development (UNRISD)/ Swiss Agency for Development Cooperation. Zali, N., Ahmadi, H., & Faroughi, S. (2013). An analysis of regional disparities situation in the east Azerbaijan province of Iran. J. Urb. And Environ. Engng, 7(1), 183-194. http://dx.doi.org/10.4090/juee.2013. Research of Geographical Sciences, The Thirteenth Year, 13(28), Spring, 217-241.